In the late 1960s, the Pueblo Colorado music scene was pretty much a family affair – everyone knew everyone, and when bands broke up, it didn’t take long before the former members found their way in a friend’s band. So was the case of Jade. By 1966, while the Chandells were at the height of their popularity, the Trolls were headed for a break-up. Monty would take his bass and leave the Trolls, joining the Colorado Springs band, The New World Blues Dictionary. But by 1968 he was looking for another band. There was talk of forming a super group with members from the now-defunct bands. Once all of the friends got together, things quickly took shape. 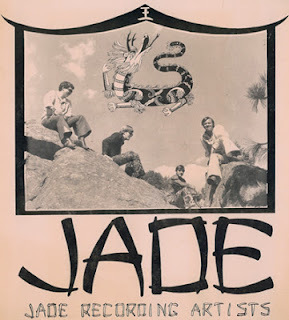 Spritzer named the new band Jade. “I was on a dragon kick, back then,” he said. Thanks to Cabell Shepard's auto mechanic father, the band also soon had an official touring vehicle - a 32-ft. long school bus. "His dad redid the whole thing. He put in a 396 motor, and we had Jade painted on the side." "Marty had a voice that would bring tears to your eyes, and a guitar that would bring joy to your heart," said Monty Baker. The A-side of the recording, "That Was Yesterday," is a moody, soft rock, slow-dance number, which spotlights Shepard's keyboard. Listen to a sample of "That Was Yesterday." The psych-tinged B-side is a stark contrast from the flip, showcasing the band's diversity, and allows each member to shine. Listen to a sample of "I'm Leaving You." Spritzer believes only 500 copies were pressed. Change would continue for Jade, when drummer Murray Watson left to join the band Joint Session. He was replaced by Joe Yates. Spritzer admits that this stage of Jade was pretty much a free-for-all, and he was unable to keep the new line-up together. The band soon broke-up. Ernie and Maxine Watta established a home base in Denver where they performed as a duo, before later moving to California. In 1983 Maxine Watta released a self-titled LP, along with the single “Real Love” (Rocshire Records 95062). The b-side, “Give Back My Love” was written by Ernie. 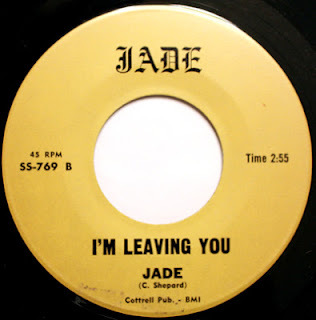 Jade’s one and only single has become a rarity among collectors, looking to find obscure local rock recordings. If money is an object (the single goes for up to $100, if you can find it), “I’m Leaving You” can be found on the Garage Zone LP set, and on the 2007 CD compilation, Psychedelic States: Colorado in the 60s. Spritzer still performs, and is currently in the group One Night Stand, which includes his daughter, Karen.